The trans Atlantic was the best performing international entity for the three large global US airlines in 2018. But some softness is surfacing in the market in early 2019. Both Delta Air Lines and United are warning that challenges are arising on trans Atlantic routes after their respective unit revenue performance in those markets during 4Q2018 fell drastically from strong results posted earlier in the year. And with growing uncertainty over the fate of Brexit, headwinds in the trans Atlantic market could intensify as 2019 progresses. Delta has previously stated that the bulk of its capacity growth in 2019 would be geared toward international expansion, but given some of the weakness in the trans Atlantic, the airline has decided that to adjust capacity in those markets after the US’ peak summer travel season. Delta and United’s strong trans Atlantic revenue gains fell off significantly in 4Q2018. Both airlines are cautioning that headwinds are surfacing in the trans Atlantic market during early 2019. Despite those challenges, for now Delta feels comfortable that it can turn a solid performance in the trans Atlantic market during the busy US summer high season. Trans Atlantic routes were the strongest performers for the large US global network airlines in 2018, helping to offset some weakness in Latin America, which stemmed from currency pressures in Brazil and Argentina. Those airlines made some gains in trans Pacific revenue, but the performance was not as strong as in trans Atlantic markets. During 1Q2018 and 2Q2018, Delta posted 11% gains year-on-year in its trans Atlantic unit revenues. But by 4Q2018 Delta’s unit revenue growth had fallen to a still respective 4% increase year-on-year, and the airline has stated that it sees “cautionary signs” for 1Q2019, noting that it expects the trans Atlantic entity to be the “most challenged”. Domestic unrest in France has affected leisure and corporate performance in the country, Delta executives have explained, and that disruption has added to a number of negative factors: currency headwinds, uncertainty over Brexit and the timing of Easter have resulted in the airline forecasting a modest negative trans Atlantic unit revenue performance in 1Q2019. 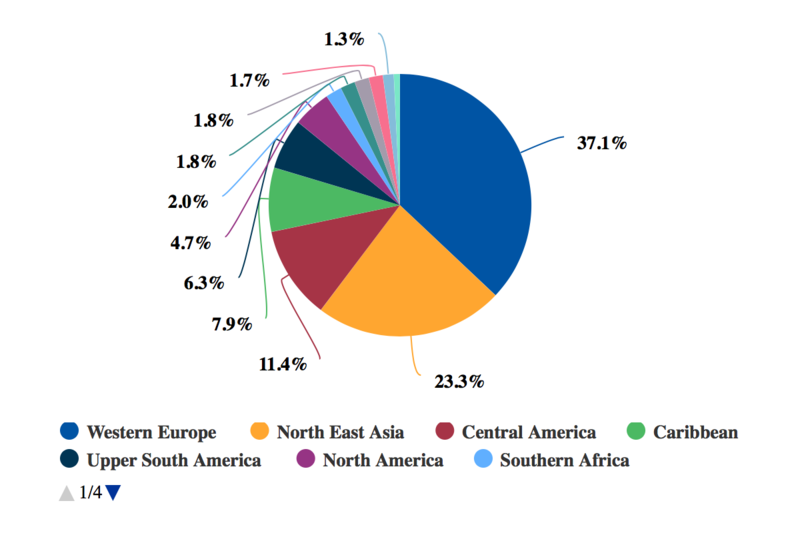 Data from CAPA and OAG show Western Europe represents 37% of Delta’s departing international ASKs as of mid-Jan-2018. Source: CAIPA - Centre for Aviation and OAG. 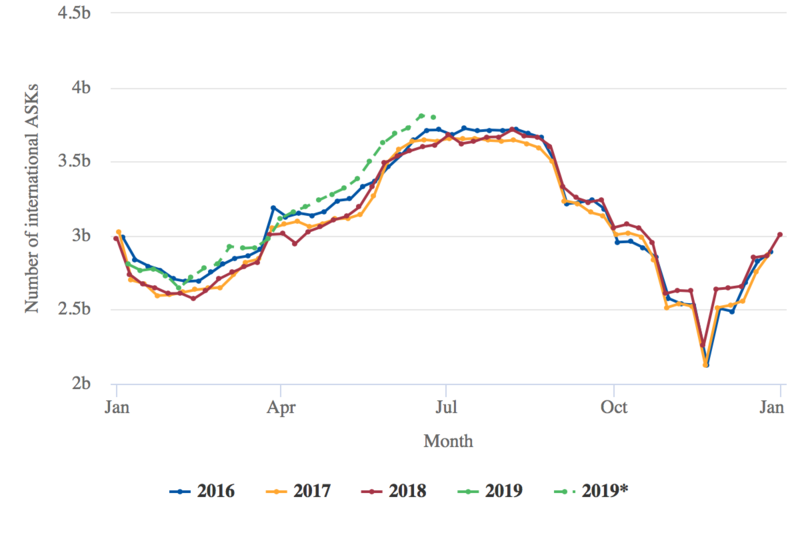 Based on early bookings, Delta believes it should post a strong performance in the trans Atlantic for the US summer high season, but also cautioned that it was watching the region closely, and would adjust its capacity during the shoulder periods if necessary. Previously, Delta has forecast system capacity growth of 3% in 2019 with a focus on international expansion, after three to four years of not growing its international ASKs significantly. Presently, the airline expects 2% to 3% international capacity growth in 2019. Projections from CAPA and OAG show that the bulk of Delta’s international capacity growth will occur in the busier US spring and summer travel periods. * These values are at least partly predictive up to 6 months from 21-Jan-2019 and may be subject to change. United’s trans Atlantic passenger unit revenues fell from 8.8% growth year-on-year in 1Q2018 to a 1.6% increase during 4Q2018. The company’s management has concluded that after two years of strong trans Atlantic PRASM growth in the market, unit revenue increases moderated during the last three months of 2018. The airline calculated that its load factors in the trans Atlantic had increased by 5.2ppt year-on-year in 4Q2018, but the growth in loads was not strong enough to compensate for declining close-in yields. 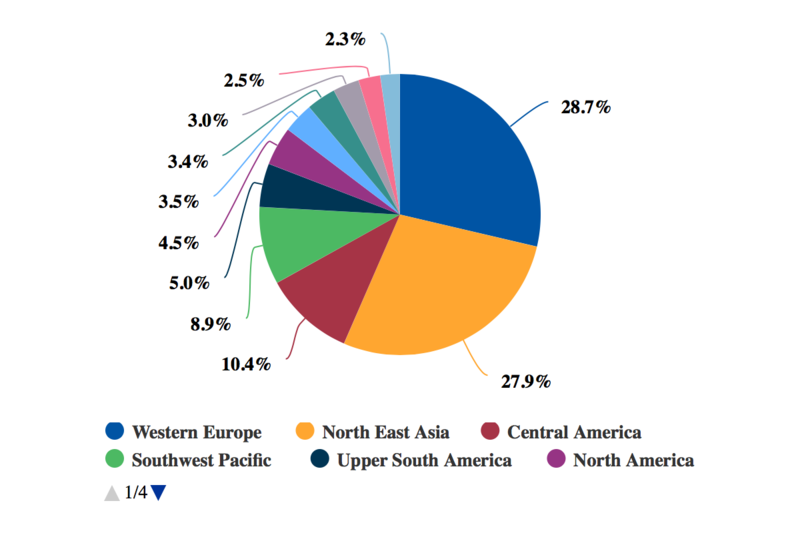 United’s departing international ASKs as of mid-Jan-2019 are slightly less concentrated than Delta’s, with approximately 29% deployed to Western Europe and 28% to Northeast Asia. United forecasts continuing weakness in coach class on trans Atlantic routes, which will result in slower PRASM growth in the market over the coming months. Data from CAPA and OAG show that United and Delta are the second and third largest airlines measured by seat deployment from the US to Western Europe as of mid-Jan-2019. The two oneworld partners British Airways and American have the largest combined share of 22.3%, while combined seats under the Delta/Virgin Atlantic JV are 18.4%. United and its trans Atlantic JV partner Lufthansa have a combined share of 21.9%. The fate of Brexit seems to change on an almost daily basis, and populist protests across France are also occurring regularly. However, Delta still believes it should post a strong performance in Europe during the summer, given lower fuel prices. Delta is also casting some perspective on falling trans Atlantic revenues, claiming that 2018 was one of the best performances in trans Atlantic markets in the company’s history. The airline's comparisons year-on-year for 1Q2019 will be tough. For the first three months of 2018 Delta posted its strongest performance in trans Atlantic unit revenue performance of 11.5%, which was driven by favourable currency conditions, strong demand for business class seats and a solid outlook for a busy summer high season. For now, Delta is taking a wait-and-see approach to the way it navigates capacity deployment in the trans Atlantic after the busy summer travel period; however, it is probably safe to predict that matching 2018’s trans Atlantic unit revenue performance is not attainable for the airline. After a banner year in 2018, US airlines appear to be preparing for a more tempered performance in the trans Atlantic market, which is home to some of the most lucrative corporate markets in the world. All through the Brexit process the large global network airlines that have a sizeable share of the US-London markets have maintained a positive outlook post-Brexit, but it remains to be seen what form Brexit will ultimately take. The only certainty for Delta and United is that their best performing international entity in 2018 will post a much more muted performance in 2019.